After my relatively disappointment with Modern Family's relative mediocrity in its seventh season. It's not terribly bad but neither is it all that great, which in turn feels worse for what had started as a pretty landmark comedy show. And so it has admittedly become less and less of a priority to watch this show versus other more interesting and innovative stuff that have come out in more recent years. 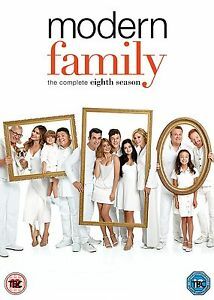 Modern Family still does its best to participate in the narrative of defining the American family given all the changes in the country's political situation. The show continued to make a stand on key issues and press their case as it were. This season did start out with some episodes that employed some rather creative concepts that made for great comedic results. And I think they did pretty well in the season even though overall interest has still begun to slip away. Synopsis: Modern Family is an American comedy series created by Christopher Lloyd and Steven Levitan. There have been talks that the show's tenth season may be its last and that may be something that will keep the show's writing more focused. The season starts with the different families on separate vacations for this or that reason. The Dunphy''s went to New York to help prove that Claire (Julie Bowen) isn't a stick in the mud. Mitch (Jesse Tyler Ferguson) and Cam (Eric Stonestreet) are still in Missouri to be with Cam's family given the terminal state of his grandmother but Mitch isn't dong too well fitting in. And Jay (Ed O'Neill) and Gloria (Sofia Vergara) are in Mexico after Jay's surprising decision to agree to the trip in the last season but Gloria's sister Sonia (Stephanie Beatriz) potentially making trouble again. This season also marks the senior year for both Luke (Nolan Gould) and Manny (Rico Rodriguez) with storylines like both of them running for class president. Haley (Sarah Hyland) begins an unexpected relationship with a minor local celebrity. And finally Phil (Ty Burrell) gets an opportunity to achieve one of his long-term careers dreams if he can figure out how to get everything arranged and financed. What I Liked: There were certainly some great moments in this season that were only possible after years of setup and other references coming together in big reveals. The best example of this is Claire's Valentine's Day surprise that started out seeming to be really crummy for Phil but ended in a most fantastic way. And then there's the odd case of Cam's Fizbo the Clown costume being used to scare locals in a rather disturbing way. "Five Minutes" was a nice experiment in storytelling as it did a sort of multi-POV piece focused on a particular snippet of five minutes of time and how everyone was busy with their own thing but occasionally overlapping. But five minutes of Manny trying to find parking was comedy gold. And as usual the show shines the most during big moments in the family history as it were, with this year being centered around Luke and Manny's graduation. What Could Have Been Better: The weight of juggling this ensemble cast is really starting to show with a lot of characters limited to being delivery vehicles for one-liners and one-off sight gags. Lily (Aubrey Anderson-Emmons) is sadly a particular example of mainly being around for quips but this season I also felt that Haley was largely limited to certain tropes like her influencer marketing bits and just being sassy around Alex (Ariel Winter). Speaking of Alex, her being away at college has severely limited what can be done with her and we have little to no context of what's going on in her life there, which in turn mirrors how they handled Haley at college. It's like the moment they get sent off they figure they don't need as much story time and the writers opt to keep the story at home with the rest of the family members. TL;DR: Modern Family more and more feels like some great individual moments scattered across a lot of less than exciting episodes and stories and it's a shame that more can't be done for the characters. More and more of them are being reduced to running gags instead of figuring out great stories for everyone to explore. And thus the 8th season only gets 3 jars of Gloria's special hot sauce out of a possible 5.